"The body is nice & squishy with a very cute face. Clara’s eyes lit up when she saw it. The tentacles are a good size for her to grasp or chew." "It’s the perfect size to throw in our changing bag when we’re out & about too." 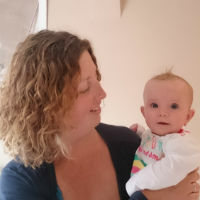 "We’re really impressed with our new rattle, including my 2 year old who likes to rattle it for Clara." "These cute rattles are fair-trade & made from 100% cotton. Not only will your bub enjoy them but another child in the world will get a better future too." Take their little adventures under the sea with this beautiful Pebble Octopus Crochet Rattle. Little hands will love grabbing this little octopus's legs, while the stripey design is great for stimulating their eyes. Made from super-soft cotton, it will soon become their BFF. The ladies who make these toys in Bangladesh smile because the toys bring them work, you'll smile because the toys keep your baby happy & your baby will smile because they love it. Oh, and Pebble products are made entirely by hand with natural materials too. Love.